5 perfect daytrips for first time Bali visitors. 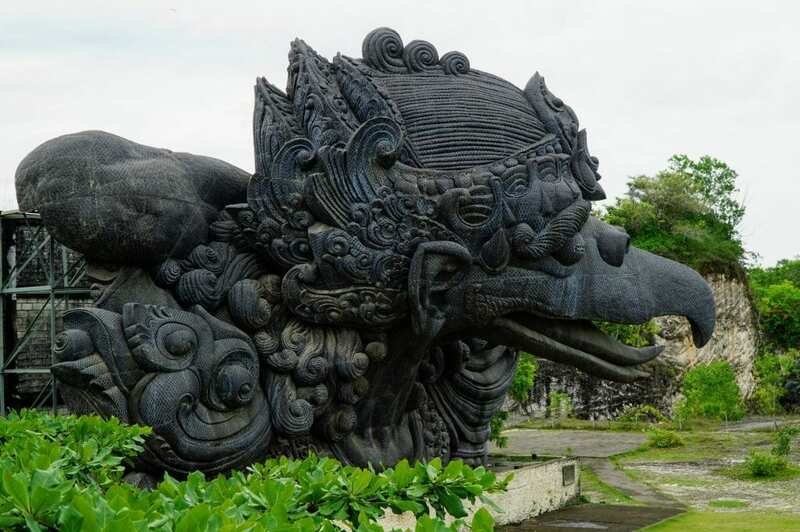 A simple itinerary for first time visitors to Bali with 5 perfect daytrips featuring fun filled activities taking you off the beaten track to explore places least traveled in Bali. Bali’s natural attractions are many. The mountainous north-central part of the island, with Mount Batur and Mount Agung can be explored taking visitors past fast rivers, crater lakes and deep rain forests. Beaches perfect for doing nothing, or active water sports … whatever you choose. Diving is popular on the coral reefs off the northeast coast of Bali, while surfers head to the south western coast seeking good surfing waves. Here are my suggested itineraries for 5 great daytrips when visiting Bali. If you’re in the mood for a lazy beach day, and a visit to some beautiful beaches and Uluwatu to take in a magical sunset and to spot a monkey or two … this is the itinerary for you! 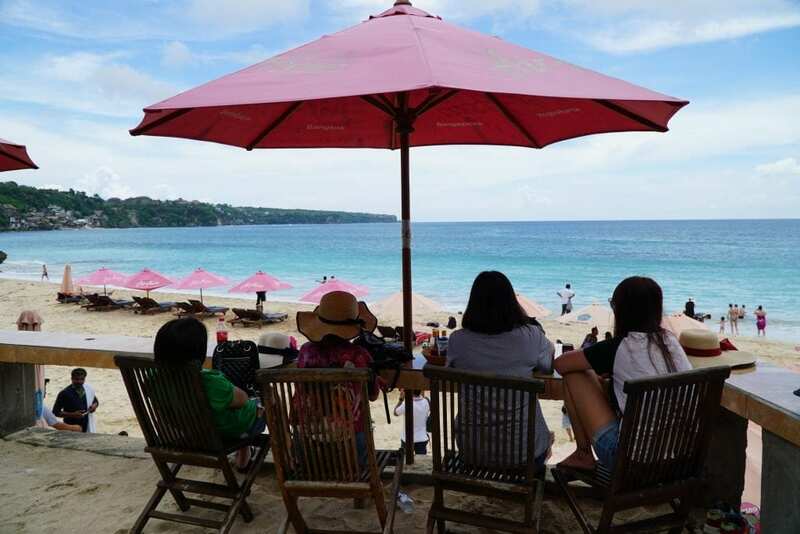 Pandawa Beach: Once known as Secret Beach, this beautiful white sand beach is laden with beach chairs & umbrellas which are offered for rent and serviced by nearby stall holders offering the obligatory Bintang beer for sale. 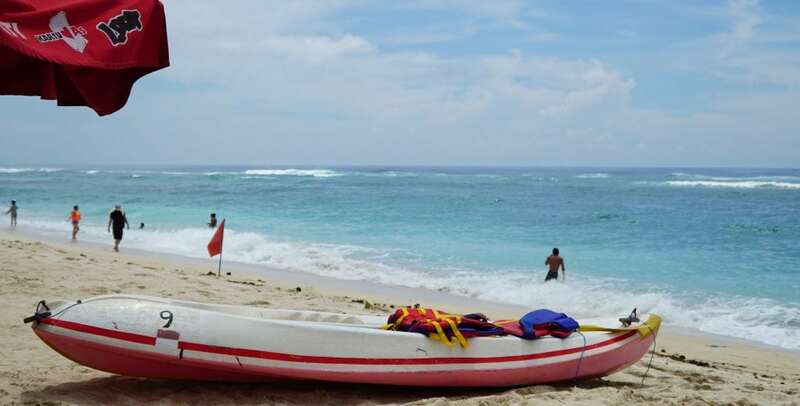 It’s also a great place to test your kayaking skills, but be careful of waves and ocean rips in the area! Dreamland Beach: A unique private beach tucked away at the northern end of Uluwatu near the New Kuta Golf Course. Recently famous as the beach where Julia Roberts filmed the movie Eat, Pray, Love. This beach was pumping great surf shore-breaks on the day of our visit which we watched from the bar cut into the side of the cliff above with an ice cold Mojito. Our lunch stop was at a traditional Balinese restaurant called Warung Cikgo. A quaint traditional Balinese open plan dining area with antique furnishings and a wall of carved Indonesian doors. We were served one of the best Massaman beef curries ever and a perfect Nasi Goreng! Put this place on your ‘must visit’ list. Uluwatu Temple: Uluwatu, is one of the best places to go to for sunset whilst you’re in Bali, with endless views overlooking the beautiful Indian Ocean and daily Kecak dance performances. A small forest lies at the front which is home to hundreds of monkeys who are notorious for snatching visitors’ belongings. They can usually be persuaded into trading the items for fruit, although this only encourages them to steal more. As we were staying in Tanjung Benoa, we decided to try one of our favourite local restaurants for dinner. Meads offers a convenient pick up and drop off service in their multi-seat golf buggy. Meads Bali: Meads has a great menu with steak and seafood options. We chose a whole fish with a Balinese flavoured sauce and a perfectly cooked lobster – both spectacular. We’ve been to Meads a number of times previously when visiting Bali and it remains one of our favourite restaurants! I wanted to take some photos of native wildlife whilst in Bali and where better to capture all species in one stop! 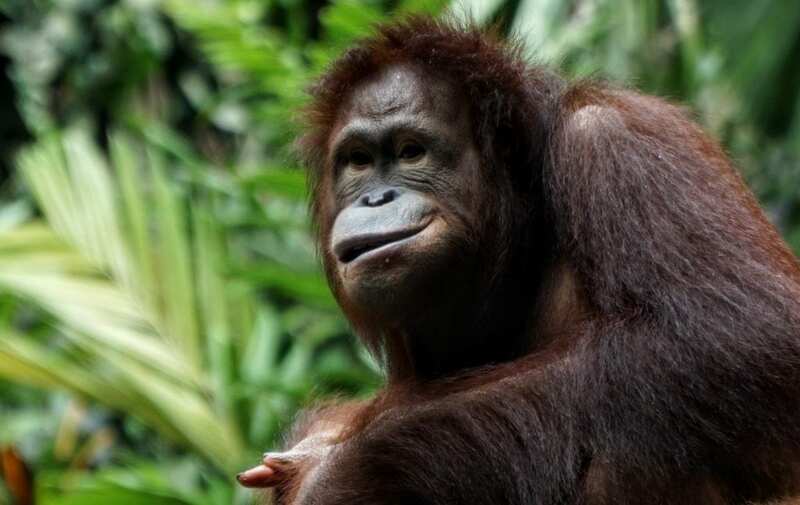 Bali Safari & Marine Park: Great near natural environments for the animals, rare and endangered species such as the Javanese Leopard, Sumatran Tigers and the White Tigers. We enjoyed the Safari experience however would have liked that to have been a longer experience. There were plenty of exhibits to fill the day including a mythical dance extravaganza and an elephant pantomime featuring the Sumatran elephants. Lunch overlooking the lions .. or were the lions overlooking us? Lions perched on rocky citadels high above the restaurant separated by plate glass windows from diners. A unique place to lunch! See our earlier post Zoos are for Big Kids Too. Sanur: Enjoy sunset at Sanur where fisherman run their nets in the shallows of an outgoing tide. Chic boutique shopping and trendy restaurants are in abundance in this relaxed part of Bali. We’ve decided to spend more time in this region next time we visit. Kampung Bule: A restaurant suggested by our driver Irun, which was a mix of traditional Balinese and Western style menu serving their popular Balinese Herb & Spice BBQ, great Seafood selections and for those who want western style – some old favourites as well. 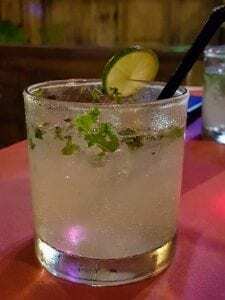 Moscow Mule: Mix Vodka with Lime Juice, muddle some fresh mint leaves and add a splash of Ginger Ale and dress with a slice of lime. You must try it! We were impressed by the seafood choices and started with a shared serving of Prawn Spring Rolls followed with Lobster Thermidor for our mains … just because! The seafood was delicious although the lobster was a little expensive, however for a special night it was well worth the expense! Garuda Cultural Centre: Touted to be the tallest statue in the world once complete, this statue has been under construction for about 20 years but is now under instruction from the President to complete by the end of 2018 in time for the world conference in Bali. Extraordinary views right across Bali, including smoking Mt Agung in the distance. Magnificent statues and vantage points throughout and I look forward to seeing the completed project. Bali Bird Park: A unique and educational attraction for the whole family. With nearly a thousand exotic birds from the Indonesian archipelago and around the world, the Bali Bird Park is a fun park for bird lovers. Hundreds of different bird species can be found throughout the park grounds in aviaries and individual enclosures. 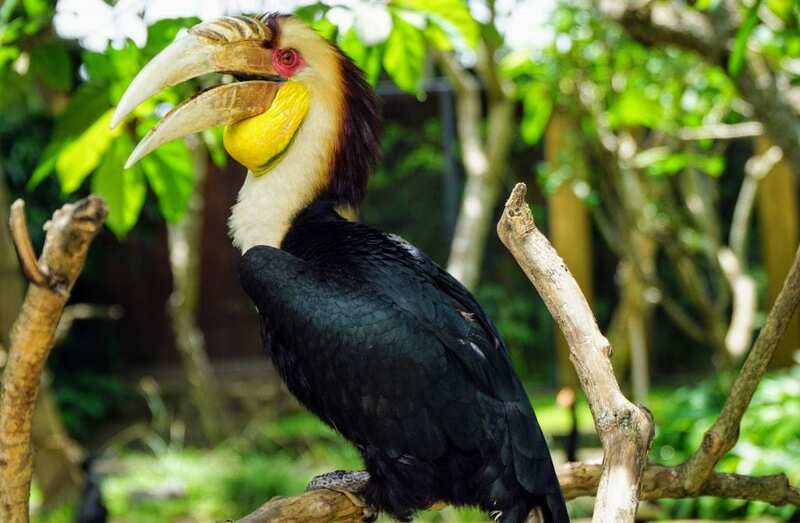 We just loved this Plain-pouched Hornbill from Myanmar’s Mergui Archipelago in the Malay Peninsula. 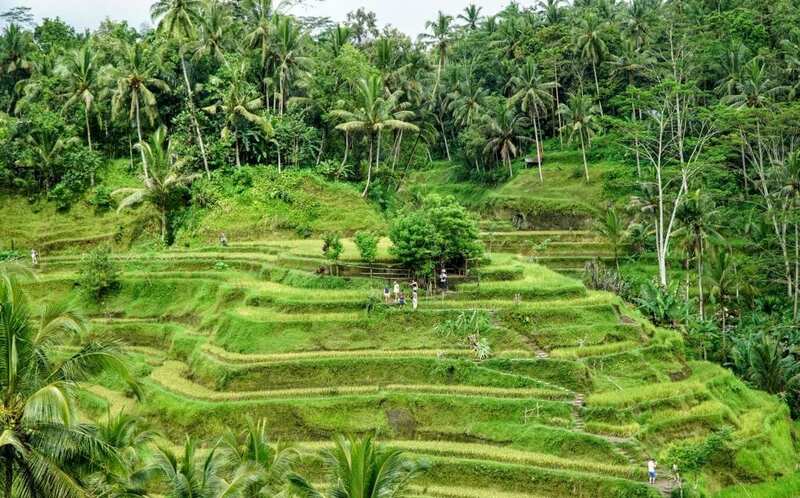 Tegallalang Rice Terraces: Ubud is famous for its beautiful scenes of rice paddies involving the subak which is the traditional Balinese cooperative irrigation system, which according to history, was passed down by a revered holy man named Rsi Markandeya in the eighth century. The Tegallalang rice terraces are a spectacular sight on the slopes across the valley. Treat yourself to a great lunch or afternoon tea overlooking the spectacular views of these rice terraces. Ubud has a good selection of boutiques, jewelry manufacturing shops, woodcarvers and artists as well as local markets where you will find a range of clothing and exquisite jewelry and unique artifacts. Don’t forget to use your bargaining skills! 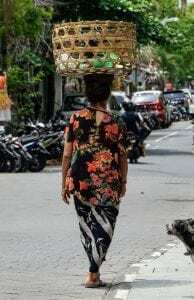 Life in Bali rolls along at a slow pace most of the time and nothing will change that. Ubud is a peaceful place where you will find yoga and relaxation classes, art and craft workshops and other creative opportunities. Take the time to explore the shops in the lanes and alley ways that are tucked away out of the main traffic zones. You may find some unique bargains! We found a great selection of restaurants and cafes to try along our walk so watch for our next post featuring our favourite food haunts in Ubud … coming soon. Monsieur Spoon: Start your morning off with a visit to Monsieur Spoon, a family-run French Bakery-Cafe started by two Parisian cousins based in Ubud. This cafe was one of our most favourite holiday finds during our last visit to Ubud. Monsieur Spoon serves handmade French pastries, cakes, artisan bread and savouries – to die for! Sacred Monkey Forest: One of my favourite places to visit in Ubud is the Sacred Monkey Forest. The monkey’s fascinate me. They are curious, cheeky, sneaky and always playful. Make sure your glasses and hats are secured, and backpacks and purses zipped up – they will attempt to steal anything they think may be food! Ubud’s Royal Palace: Ubud Royal Palace (Puri Saren Agung Ubud), is one of Bali’s most interesting attractions located right in the centre of Ubud. 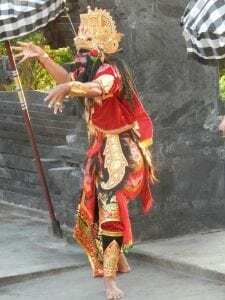 The royal family is in residence most of the time and most nights during the week the Royal Palace hosts authentic Balinese dance performances, such as the Barong Ubud dance. Stop in for lunch at Oops Bar and Cafe … What a great find. Just an ordinary pub on the outside, but a delicious lunch with icy cold mojitos on the inside! Check out all the antiques, wood carvings and shops full of unusual nic-nacks. An early 9 am pickup by our driver Irun who took us into the hinterland beyond Ubud to view some of the most significant temples in Bali and world heritage listed rice terraces. Taman Ayun Temple: Pura Taman Ayun as a beautifully appointed temple with it’s own surrounding moat, located in the village of Mengwi Bandung. Historically the temple is associated with the King of Mengwi. This temple is where people come to worship the ancestors of the royal family of Mengwi. 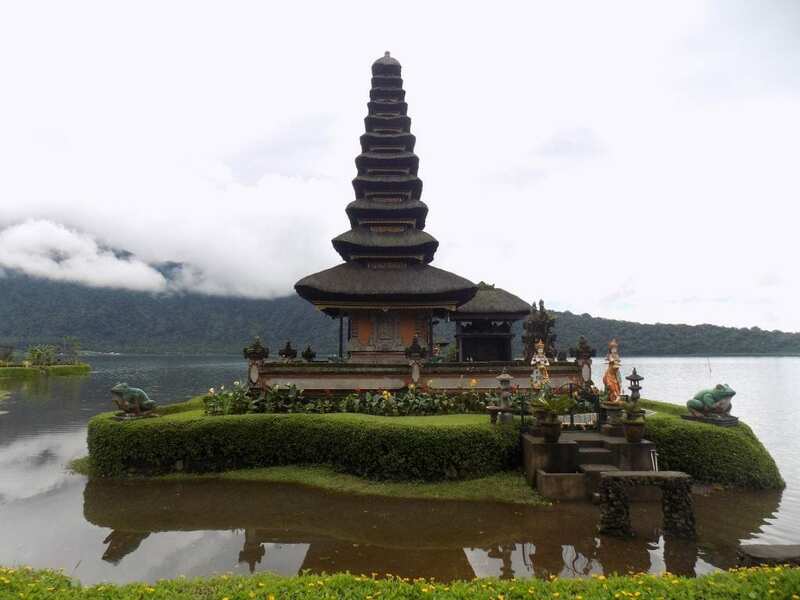 Pura Ulun Danu Bratan: On the shores of Lake Bratan this temple is the primary temple of the many temples and shrines which are vital to the subak irrigation system popular in Bali. 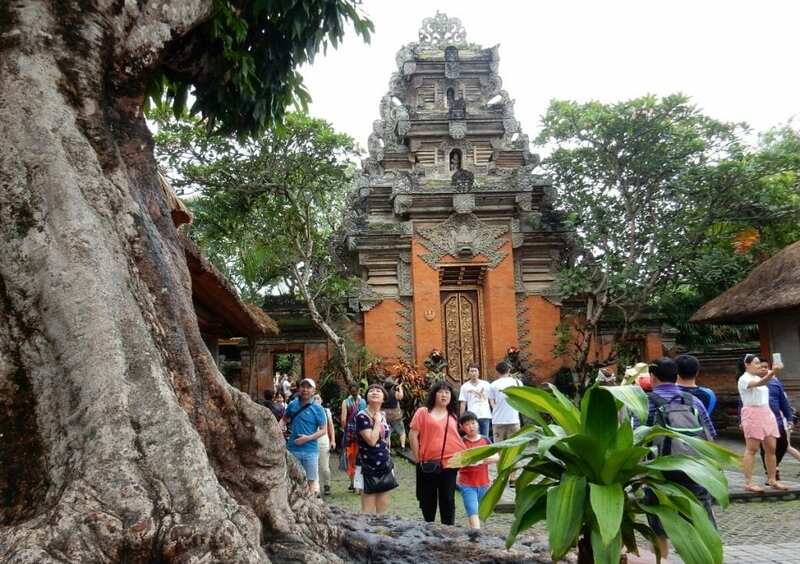 Built in 1633, this temple is used for offerings ceremony to the Balinese water, lake and river goddess Dewi Danu. Lake Bratan is the main source of irrigation in central Bali. Lake Bratan is known as the Lake of Holy Mountain due to the fertility of this area. Lunch at Gong Jatiluwih in the Jatiluwih Rice Terraces, Central Bali was a perfect Balinese lunch experience. The restaurant has been around for many years and is a popular lunch stop for tourists visiting the inland regions of Bali with spectacular views over the rice terraces. 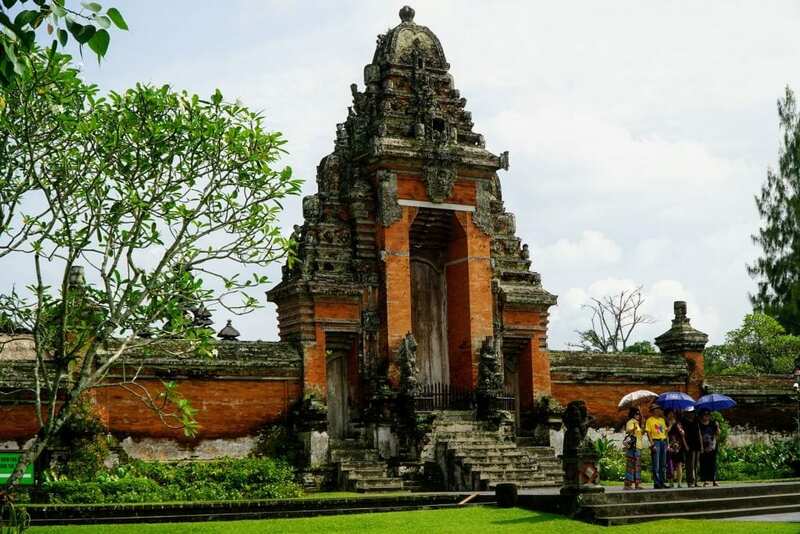 Goa Gajah: Located just 10 minutes from Ubud, Goa Gajah is a significant Hindu archaeological site. Known as the Elephant Cave because of its close proximity to the Elephant River, this mysterious cave is surrounded by a courtyard of rock-wall carvings, a central meditation cave, bathing pools and fountains. Its a peaceful setting with Hindu guides who provide details of the history of this serene place. A visit to Goa Gajah is definitely a ‘must see’ and well worth including on your itinerary. These suggestions are totally flexible so you can pace yourself to be as busy or as slow-going as you want. Pace out your holiday, enjoy your adventures and make sure you leave plenty of down time for relaxing … after all you are on holidays!! Have you been to any of these places when you’ve visited Bali ? Is there somewhere that made such an impact on you that you’d consider going back to? Perhaps I’ve left out somewhere that you think should be included .. I’d love to know .. let me know in the comments below.